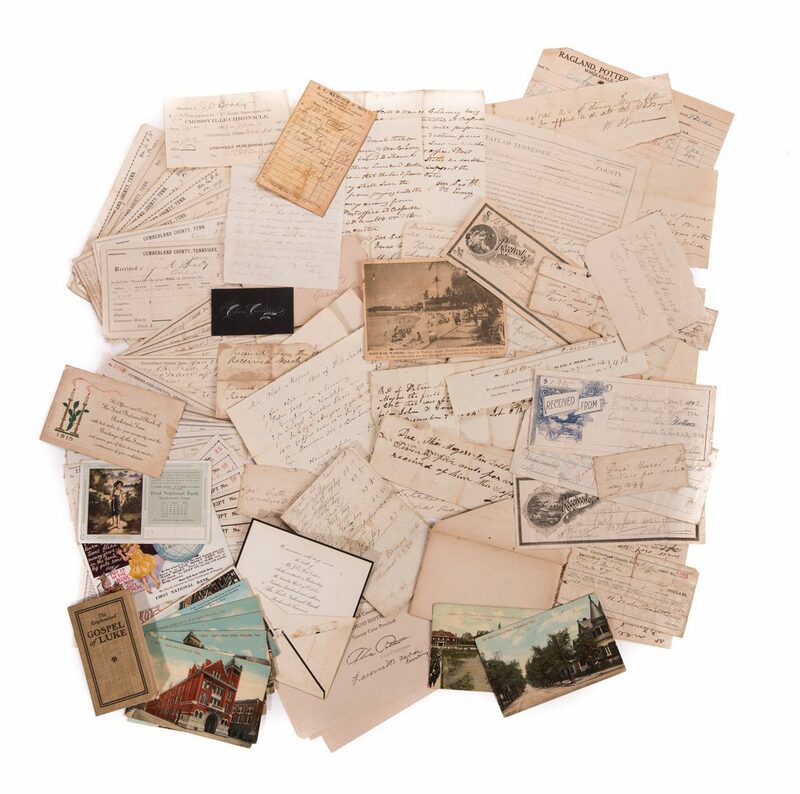 Large group of documents pertaining to the estate of Thomas Major of Cumberland County, Tennessee. 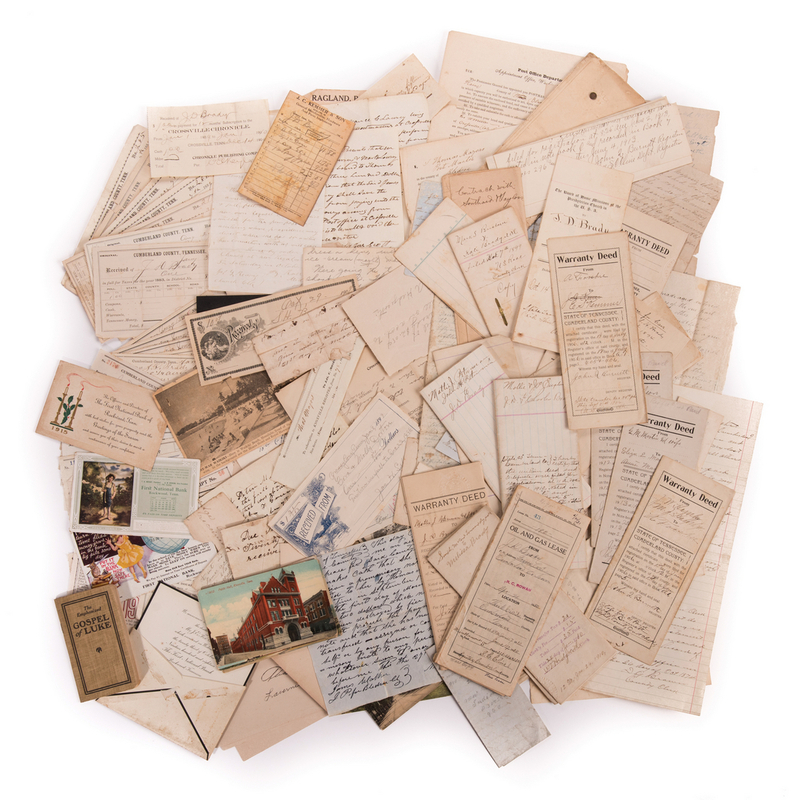 100 plus items, mostly letters, promissory notes, receipts. 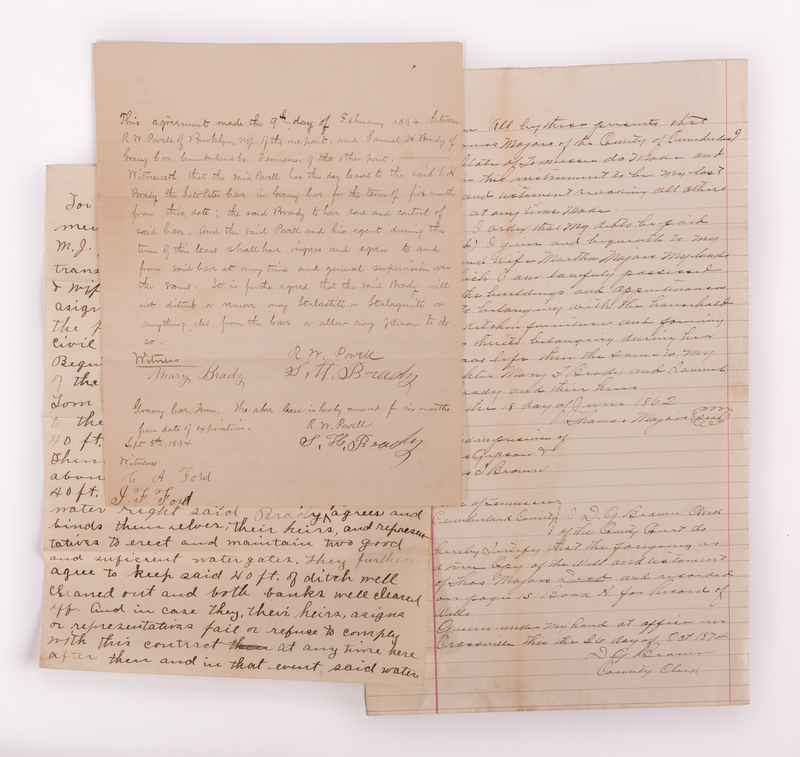 Includes the Last Will and Testament of Thomas Major dated June 18, 1862, in which he appoints his wife, Martha Major as executor, witnessed by James Gibson and James D. Brown, County Clerk of Cumberland County. Also included is a Cumberland County document acknowledging the Will of Thomas Major and Martha Major as executor, dated August 4, 1862, witness by John B. Nail, Clerk at Office. Also included is a Bond between Thomas Majors and Mary Majors: nul [sic] and void this Feb 20th 1850, attested by William Majors and J. W. Majors. a Bond between the heirs of Peter Majors and William Majors, dated December 31, 1846, signed by six heirs including Thomas Major and one name that has been blackened out. Also included is a Bledsoe County document acknowledging a permissory note between Nicy L. Majors and Thomas Majors for the sum of $62, dated February 27, 1852, signed by James Mather, Justice of the Peace. 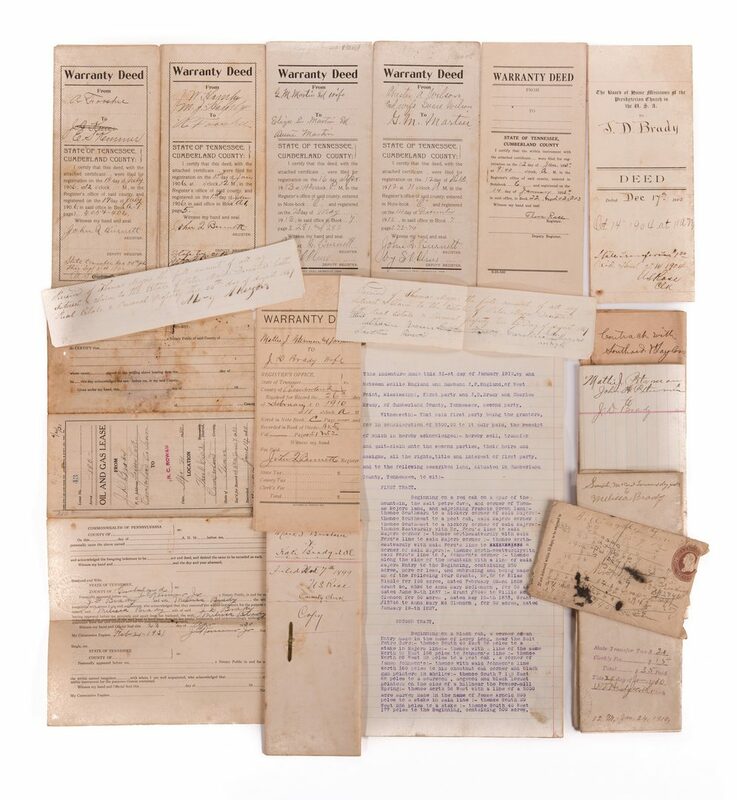 Includes additional documents such as four copies of Thomas Major land documents, two Postmaster of Bledsoe County appointment notifications, receipts, permissory notes. Group of nine receipts regarding the estate of Peter Major of Cumberland County, TN, four of the receipts are on a single page, and are signed by the heirs in affirmation that they had received: of Thomas Majors the full amount of all my interest and claim to…both real estates and personal property, eight dated August 24, 1847, one dated August 26, 1847. 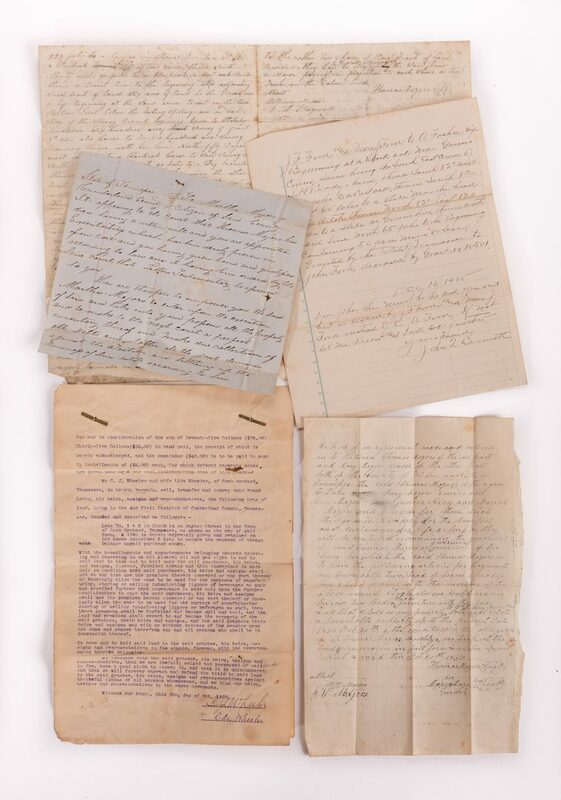 Nineteen assorted land deeds, leases, and contracts concerning property and other commerical goods and services of Cumberland County, TN, affliated primarily with the Brady family, dated from November 7, 1899 to January 12, 1935. 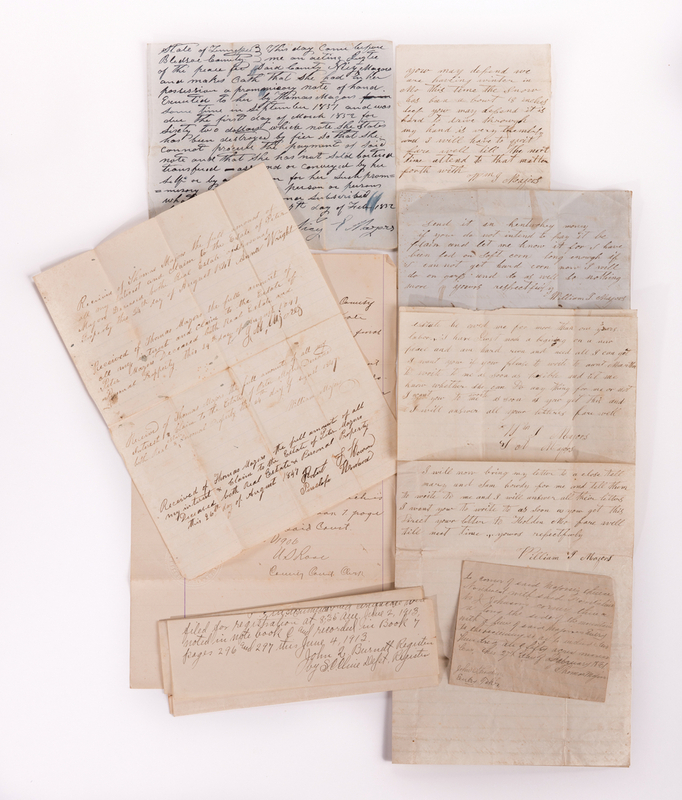 Four personal letters from William J. Majors of Holden Village in Johnson County, MO, regarding financial matters, one addressed to his uncle, dated September 17, 1859, one addressed to Mrs. N. Thomson dated March 10, 1867, countersigned by J. A. Majors, and two addressed to Martha Breeding of Grassy Cove, TN, his aunt, one dated March 26, 1867, and one dated January 13, 1873. 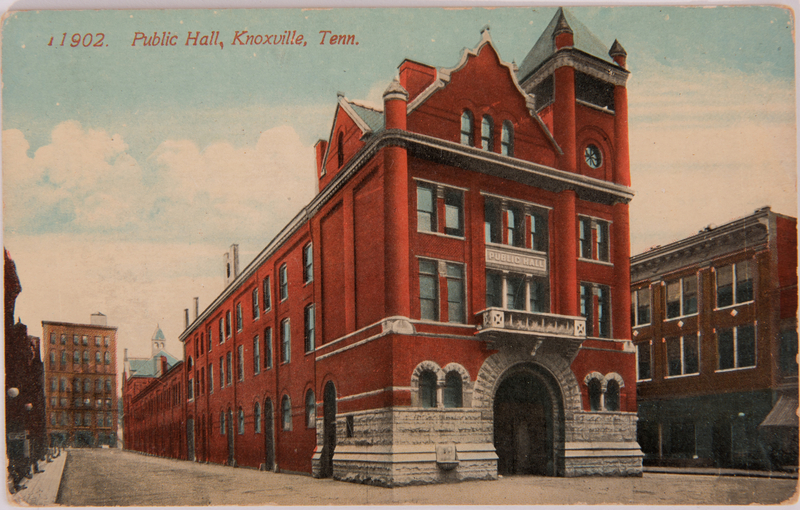 Two personal letters from S. S. Hale of Pikeville, Kentucky, regarding the estate of Stephen Breeding, both addressed to Martha Breeding, his mother, dated January 12, 1886 and March 3, 1886. March 3, 1886 letter includes U.S. Postage Two Cents envelope with receipts. Group of thirty one Cumberland County, TN, tax receipts for members of the Brady family and one for C.W. 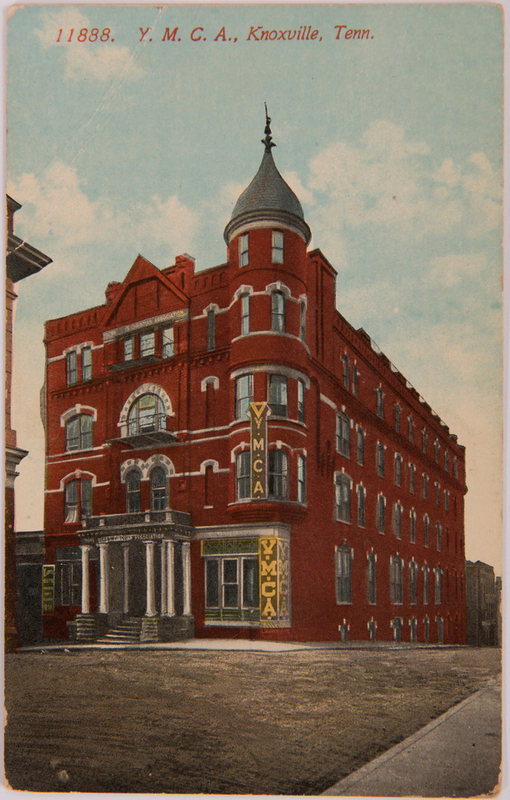 Ault, dated interspersedly from January 30, 1884 to May 26, 1934. 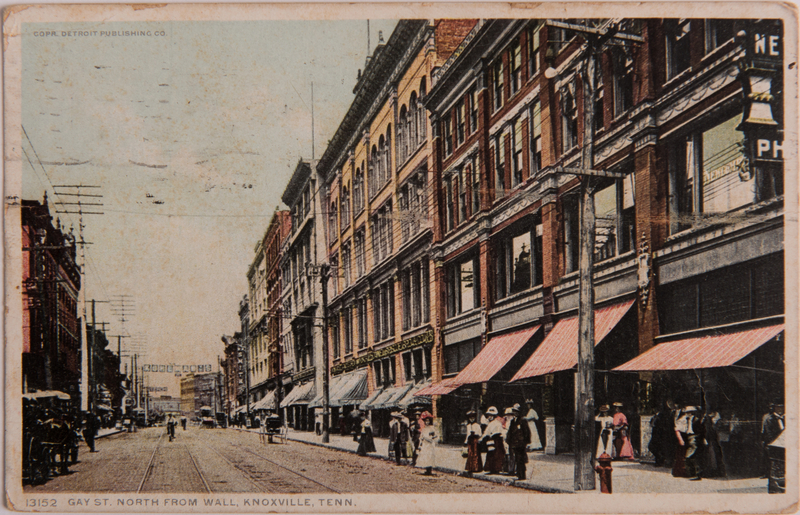 Large group of assorted East TN letters, receipts, nine postcards of Knoxville, Chattanooga, and Nashville, a small cloth bound copy of THE EMPHASIZED GOSPEL OF LUKE, a wedding invitation, a death notification, and more. CONDITION: Documents exhibit water damage, insect damage, stains, tears, general wear to be expected from age.